Warren Miller Film Tour, Other Things To Do Series Starts, Flat Light Polka. It is October and our natural, built-in annual calendar says it’s time for a Warren Miller flick to remind us how graceful, funny, and exhilarating snow sports can be. As long as we can remember, the official pre-start of the snow season has been the viewing of one of Warren’s new films. Last January, we lost Warren, but his films live on. Below, you’ll find a sample of some Old School footage. And the Warren Miller Film Tour, kicking off on Oct. 12, is coming to a theatre near you! Sponsored by Volkswagen and many others, you can catch the Face of Winter in your neighborhood. Click here for details. Here’s the trailer for Face of Winter. Enjoy. We’re starting a short series from correspondent Yvette Cardozo who will be telling us about other things to do in the winter besides slide down mountains or trails. This week, she describes an ice fishing outing around Sun Peaks Resort in British Columbia. If you or your spouse need a diversion or a step down from your usual winter routine, some of these alternatives might be fun. Gets you outdoors and doing positive things. That’s the point, right? We also hear from correspondent Jan Brunvand who not only advises us to watch out for dreaded flat light conditions, but also gives us a little ditty he wrote called “The Flat Light Polka”. Flat light can really ruin a day’s outing, so, humor aside, it is a hazard we can be mindful of, especially at the beginning of the season when all things are tentative. As we mentioned last week, getting ready for the season should be your prime objective, conditioning-wise. this time of year. We’ve been asked to point to some exercises that might be useful for senior folks. A couple of years ago, we did a neat series of progressive exercises featuring Rick Silverman, a physical therapist and professional exercise consultant. You can find the progressive, three-part series by clicking on these links: Easy Starters, Up A Notch, and Challenge Yourself. As with all new and demanding physical activities, you should consult with your health care professional if you have any doubts or questions. One more reminder, we are having a gathering of folks in NYC on Nov. 14. 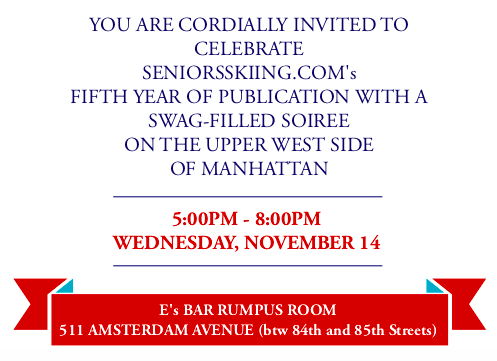 We’ll have some raffle items, some give-aways, and a chance to meet other senior snow sport enthusiasts. Come on down.